“I remember thinking it was hot, hot, hot. My adrenaline was going, and all I could think about was getting out.” Dan Summers, 39, is describing what it feels like to be stuck in a vehicle on fire. He knows because two years ago during an off-road adventure in the Sonoran Desert’s Glamis Dunes, he found himself trapped in a burning sand rail (similar to a dune buggy but designed specifically for sandy terrain). Dan grew up in Riverside, where his dad started an appliance repair business that Dan now runs. He lives in nearby Moreno Valley with wife Alison. Dan became interested in off-road vehicles when he was a boy. “I would see all the RVs and trailers,” he shares. “I knew as I got older it was something I wanted to get into.” Dan got a dirt bike at 21 and eventually purchased a quad. The day of the fire, Dan was a passenger. Winds were high, so he and his friends stayed in camp most of the day. “When the sand blows across the dunes, it’s hard to see the drops,” Dan explains. Finally the wind lessened, and the group headed out for some fun. They rode for a couple hours, and on the way back, the sand rail’s motor stalled. Dan says, “My friend Kirk was about to get out and check the motor, but when he looked in his rearview mirror all he could see was flames.” Although Dan knew from years of experience that the harness buckle was in the middle, in the panic of the fire he reached down to his side, as if he were in a passenger car. Wisely, the pair had worn helmets that supplied fresh air and were wired for audio communication. Dan yelled to Kirk, who reached over and popped Dan’s belt before exiting. “I tried to get out, but my right foot felt like it was stuck to the floor,” Dan says. When Kirk realized his friend was still trapped in the vehicle, he tried to pull him out. “Kirk’s a big guy,” Dan says, “but he couldn’t get me out on the first try.” Although he burned his hands on the second attempt, Kirk managed to extricate Dan, whose clothing was on fire. He rolled in the sand to extinguish the flames, but he was severely burnt. Meanwhile Alison, who had stayed in camp to make dinner, was waiting. And waiting. “Then I saw a helicopter and a bunch of lights about three dunes away,” she says. “I thought, oh this is bad. Never in a million years did I think it was Dan, though.” The other riders in Dan’s group returned soon thereafter and told Alison what had happened. She knew that he was hurt, but she got the impression he’d be able to make the trip home the following day, so she began packing up their 65-foot rig. Other “duners” gathered at the accident scene. While waiting for help, they did their best to make Dan comfortable. Dan was very aware of two things. “I knew it wasn’t an ambulance thing,” he says, “and I knew I was going into shock—I couldn’t stop shaking.” In response to Kirk’s 911 call (the only time he left Dan’s side), REACH 9 responded from their base in Imperial, sending Pilot Matt McLuckie, Flight Nurse Brad Sparks and Flight Paramedic Mia Norton to pick Dan up and take him to UC San Diego’s Trauma Center. The REACH 9 aircraft prepares for takeoff. Mia Norton has been in EMS since 1999 and with REACH for six years. “Dan is one of those calls I’ll always remember,” she says. 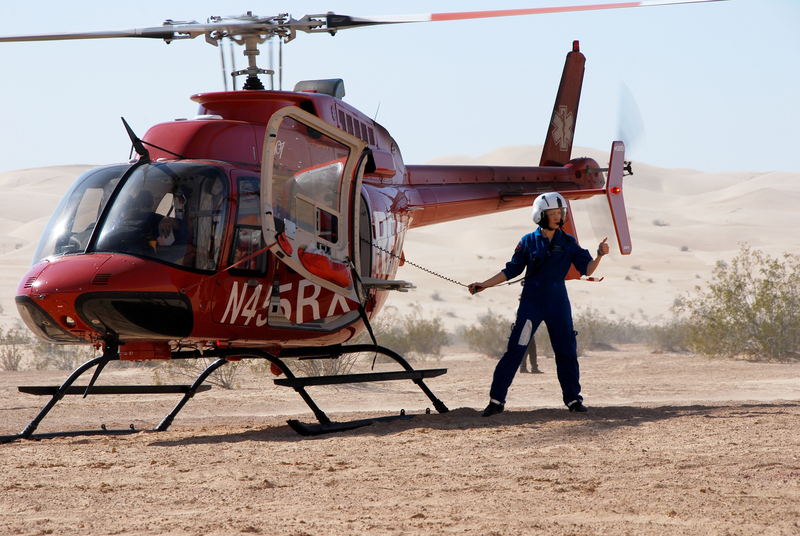 “Sand dunes are very challenging to land in, and you don’t always have ground support. Every challenge that could have presented itself did.” Thanks to their skills, training and teamwork, the crew was able to handle those challenges. “The communication between the three of us was seamless,” Mia reports. Dan’s wife, Alison, didn’t have an opportunity to speak with the flight crew before they lifted off. 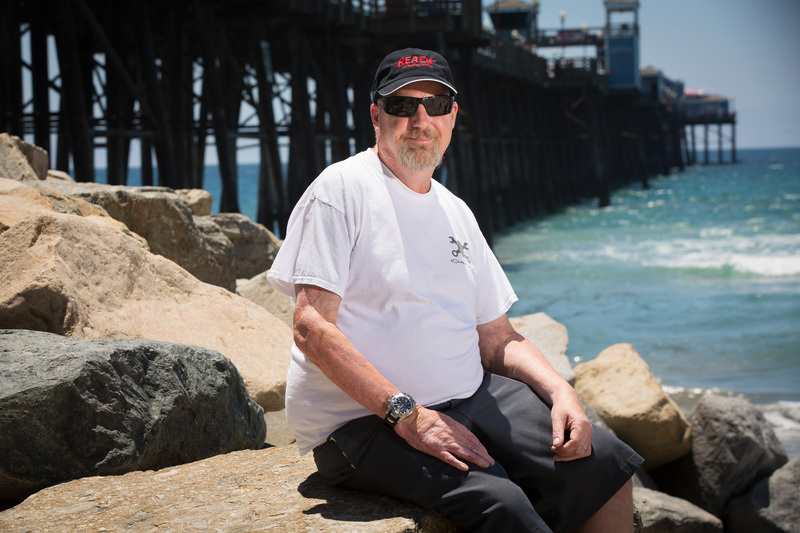 “My first contact was a call from Brad telling me Dan was at UCSD Trauma,” she says, adding, “REACH is really good about calling.” The doctor also contacted Alison to report that her husband was conscious, talking and knew where he was. Before sending Dan to the burn unit, where his scorched and sand-riddled skin would require aggressive cleaning, they wrapped and intubated him—and medically induced a coma. 40% of Dan’s body required skin grafts. He had 15 surgeries total, 10 while in the coma. Alison says, “In the beginning, I went into my own state of shock for about 11 days. I couldn’t even swallow water.” Alison’s family members quickly headed south from Sacramento to provide comfort and support. Survivor Dan Summers is happy to be back home with his family. Another source of support was Kirk. “After the accident, whenever Alison needed anything, he was there for her. And he’s still there for us,” Dan says. 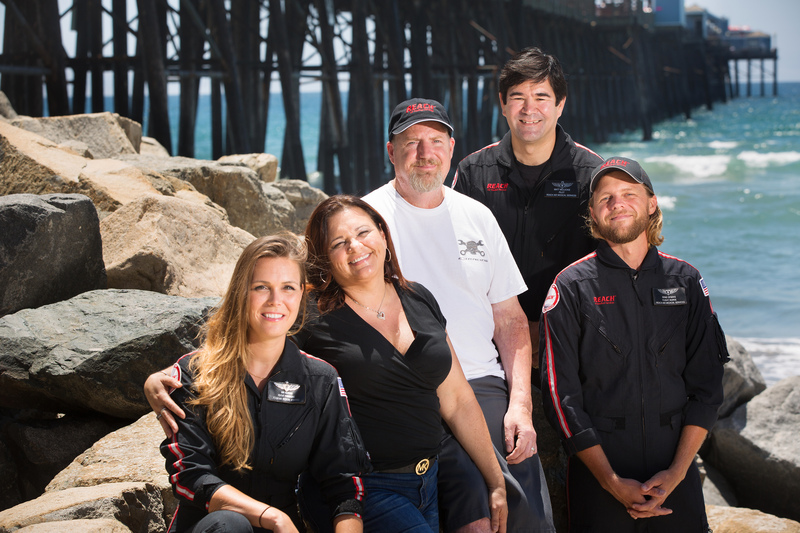 The Summers and Dan’s flight crew hope to have a reunion in the near future. But Mia says it’s rare to get news about transport patients once they’ve been safely delivered to a medical facility. “Getting feedback about patients moves me to tears,” she says. “It means so much to know we’ve done our job well.” It’s no wonder Mia’s skills are sound; she’s been practicing since she was a little girl. “I remember exactly where I was when I saw my first ambulance. I asked my mother what it was, and I said, ‘That’s what I want to do.’ I’d put red food dye in water and give my dolls transfusions. I took a CPR course when I was 12, and I was a candy striper. I quit the basketball team my senior year to take an EMT class at night.” She says her job with REACH exactly matches her original career goal. “It’s a privilege to have been hired by REACH,” she states. “I’ve had a lot of great moments, too,” Dan offers. He talks about one of his favorite days. He was walking around his floor, and when he passed the waiting room his favorite smell wafted into the hall. Dan smelled In N Out. He went in and chatted with the family that had brought it, and the next time he passed by one of them came out and gave him a burger. “I was in heaven,” he says earnestly. “To this day, I don’t know if they realize what they did for me.” Another particularly special event was Dan and Kirk’s first return trip to Glamis. On that trip, Dan road a quad. L to R: Flight Paramedic Mia Norton, Alison & Dan Summers, Pilot Matt McLuckie, Flight Nurse Brad Sparks. How’s Dan doing now? He says that on a scale of 1 to 10 he’s an 8 or a 9. “Everybody is blown away. My occupational therapist has never seen anyone come out of surgery so well,” he reports. Alison believes that their closeness contributed greatly to Dan’s recovery. “We’re incredibly bonded,” she says. “I think that’s really important.” We at REACH certainly won’t argue with the healing power of love.